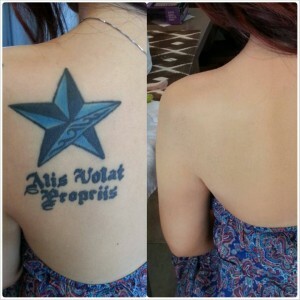 Did you know that it is now possible to conceal your tattoo without resorting to surgery? It is also easy to do and lasts for up to 18 hours and is even waterproof! Using para-medical skin camouflage products you can effectively conceal your tattoo or tattoos. You need firstly go to a qualified and skilled para-medical skin camouflage specialist who will advise you on the best products for your skin type and skin colour of your skin – and at the same time teach you how to conceal your tattoo so you can do it yourself at home. The process of concealing your tattoo includes using different types of professional cosmetics or skin camouflage products in layers and then sealing the layers with a special setting powder. It is vital that you use the correct professional cosmetic products which are perfect for you so that your tattoo is concealed completely. Being able to camouflage your tattoo will allow you to wear clothes that you may have previously avoided as they allowed your tattoo to show. Now you can go out shopping and buy all those items that you have longed for. If your wardrobe is full of clothes that do conceal your tattoo, on the days that you wear those clothes you will not need to use your cosmetic tattoo concealing products. It may be that you like your tattoo but feel that on some occasions it may be a better option not to show your tattoo such as for a job interview, your wedding day or attending a business networking event. With the professional full-coverage makeup you can make your tattoo disappear and you don’t need to be concerned that during the day (or night) the make-up will smudge or rub off. The products last up to eighteen hours and are even (as said before) waterproof so even on a rainy day you will still have 100% concealment of your tattoo. In fact, the professional cosmetic products can only be removed using a particular brand of skin cream cleanser. There is no pain involved. 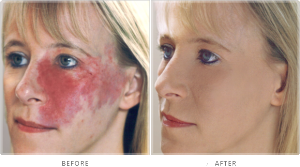 There is no scarring such as you would have with cosmetic surgery. The products last up to 18 hours, do not wear off during the day or during the night. The para-medical products are also waterproof. You have the flexibility of using the products only when and if you feel you need to cover up your tattoo. With practise the process of applying the layers of professional cosmetics and sealing powder is quick and easy to do. If you feel embarrassed and self-conscious about your tattoo, with paramedical cosmetics you will find your confidence is restored and your overall mood is improved. Elaine works in Brisbane and is highly experienced and qualified in the art of skin and tattoo camouflage and she will help you make your tattoo disappear. During a consultation Elaine will provide you with a list of the professional cosmetic products that she has identified as best for you and your skin. Most importantly, all the products that Elaine will recommend are hypo-allergenic so there is little chance of skin irritation for sensitive skin even with regular use.